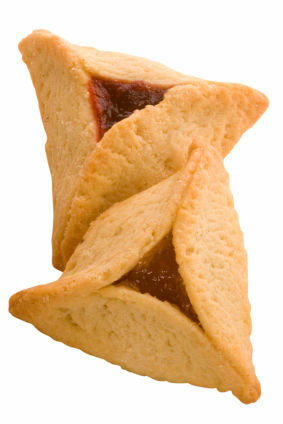 Hamantaschen are delicious cookies that symbolize the three-cornered hat worn by Haman, the arch villain of the Purim story. Directions: Cream the margarine and sugar. Sift the dry ingredients and add to margarine and sugar mixture. Mix well. Add the eggs, orange juice and vanilla. Knead until dough forms and divide into 6 sections. Refrigerate until chilled. Roll out sections on a floured board. Use a glass as a cutter for forming circles for the hamentashen shape. Place a tsp of filling into each circle and fold into a triangle by pinching the edges together. Bake in 325 degree oven for 25 minutes.